In Intermediate Cantonese, learn to speak and understand Cantonese through discussions of contemporary topics between two good friends. Watch video and learn about greetings, shopping, food, dining out, weather, education, literature, holiday traditions, and more. With our specially designed video player for language learning you can pause the video at any point and scroll the transcription. Read annotations about culture and grammar. Click on almost any word or sentence to hear it spoken, along with translations. This course can be used either by independent learners or by students in a traditional or self-instructional classroom setting, and is the equivalent of the material covered in a one-year college course. This course was originally published as part of the highly-reviewed University of Arizona Critical Languages Series. 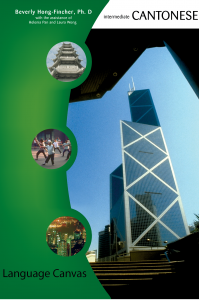 We have added many new mobile-friendly features that help you learn Cantonese on desktops, tablets, and smartphones. It contains 20 video clips and over 10,000 audio recordings made by native speakers. Beverly Hong-Fincher received her Ph.D. from Indiana University in linguistics, and M.A. from University of Michigan, also in linguistics. Her B.A. is from the Taiwan National University in Foreign Languages and Literatures. Her teaching experience includes the University of Washington (Seattle), Middlebury College, George Washington University (founder of the Chinese Program), The Connecticut College (Chair of Chinese and Japanese) and the Australian National University. Aside from her early work on Navaho, “The Phonemic Status of Navaho Stress” in Anthropological Linguistics, her later publications mainly focus on content-based language teaching/learning and sociolinguistics. She has published two books in the field of Mandarin Chinese: “Situational Chinese“, New World Press, Beijing (audio recorded by actors of the People’s Art Theatre); “Speak Chinese Today“, Charles Tuttle, Tokyo. Among her better known students is Kevin Rudd, former Prime Minister of Australia. Intermediate Cantonese materials © 1995-2019 Arizona Board Of Regents on behalf of the University Of Arizona. Used under license.